The Late Fall season of the Downtown Marquette Farmers Market begins this Saturday, November 3. The market is inside the Marquette Commons building, a few vendors will be outside. Come purchase fresh produce directly from the grower, what a privilege to meet who planned and grew your food. How to store: Store in a cool, dark place. Once cut, store in the refrigerator. Cut the squash in half lengthwise. Use a large spoon to clean out the seeds. (Set seeds aside to roast later. https://www.thespruceeats.com/roasted-squash-seeds-2355361 ) Add water and the cleaned squash helves to the slow cooker. Set the slow cooker to low for 6 hours or until squash is easily pierced with a fork. Scoop cooked flesh from the skin and mash lightly. store in the refrigerator, or place in a freezer bag, label and freeze for future use. Tip: Use this cooked squash as a substitute for any recipe that calls for canned pumpkin puree. Place all ingredients in a food processor. Blend until smooth. 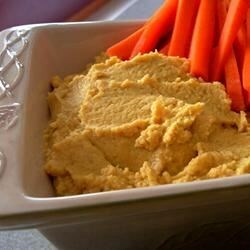 Serve with sliced fresh vegetables, crackers or lightly toasted pita bread wedges.